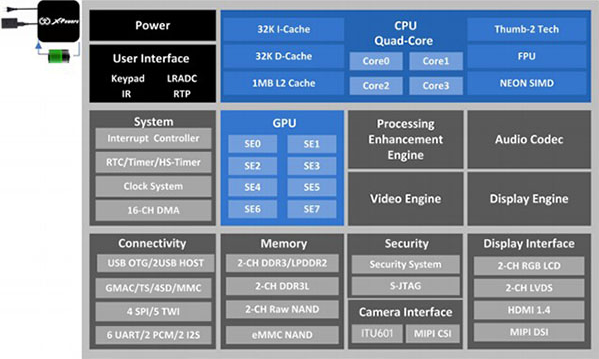 Cortex-A7 is the most power efficient application processor from ARM, and incorporates all the features of the high-performance Cortex-A15. Allwinner A31 processor is based on the quad-core Cortex-A7 CPU architecture, greatly improving the computing capability and reducing the system power consumption. ARM POP IP provides the best Performance/Power tradeoff enabling ARM partners with core-optimized Physical IP, PPA [Performance, Power, and Area] predictability through ARM certified benchmarking and Time-to-market through ARM knowledge transfer. 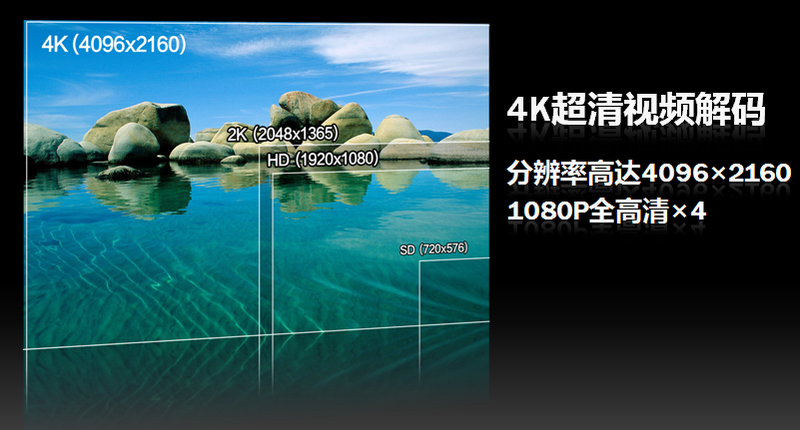 Allwinner A31 processor is capable of UHD 4K video decoding and Blu-ray 3D playback. It supports various mainstream video formats, including Mpeg1/2, Mpeg4 SP/ASP GMC, H.263, H.264, etc. 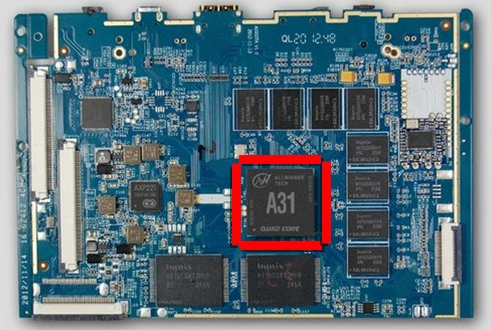 Allwinner A31 features 64-bit DDR and 16-bit NAND Flash, making faster data read and write available. PMIC AXP221 is specially made for A31 processor, which is capable of dynamic voltage and frequency adjustment. A31 processor can support up to 30 days standby time. Onda V812 Tablet configured a 8 inch IPS screen with 1024*768 resolution. Onda V812 is installed with Android 4.1.1 OS. Onda V and support Android 4.2 update, Onda V812 adopts All Winner A31 Quad Core chip and strong 8 Core [not, just 2 cores each with 4 shaders/pipelines see here] Power VR SGX544MP2 GPU.Onda V812 have White and Black version, will lead a new time of 8 inch Quad Core Android Tablet PC. Onda V812 will support pre-order on Dec 17th,2012.All pre-orders will send a HDMI cable as a gift.Thank you for your attention. Video: 4K HD Videp Play with formats of MP4/3GP/3G2/RM/RMVB/ASF/FLAC/APE/MOV etc. The bigger, 10” model with Retina display, Onda V972 went to the Amazon China sale on the same day for $208 as it was earlier (see below in the original post for the specification). Indicating Microsoft Windows 8 as supported is especially intriguing feature so I highlighted it here in the red. In fact I did not expect that at all. Onda V972 Quad Core is the first Allwinner A31 Quad Core Onda Android Tablet.Onda V972 Quad Core adopt A31 Quad Core CPU and 8 Core [just 2 cores each with 4 shaders/pipelines see here] Power VR SGX544MP2 GPU,can perfect support 3D Games.Onda V972 configured a 9.7 inch Retina IPS screen with 2048*1536 High-resolution.What’s more, Onda V972 build in Apple iPhone 4 OV Camera that insure consumers a nice experience with it. Onda V972 Quad Core is the first Allwinner A31 Quad Core Onda Android Tablet. Onda V972 Quad Core adopt A31 Quad Core CPU and 8 Core Power VR SGX544MP2 GPU,can perfect support 3D Games. Onda V972 configured a 9.7 inch Retina IPS screen with 2048*1536 High-resolution.What’s more, Onda V972 build in Apple iPhone 4 OV Camera that insure consumers a nice experience with it. Chinese tablet maker Onda has unveiled one of the first tablets featuring Allwinner’s new quad-core processor. The Onda V972 is powered by an Allwinner A31 chipwhich features 4 ARM Cortex-A7 cores. 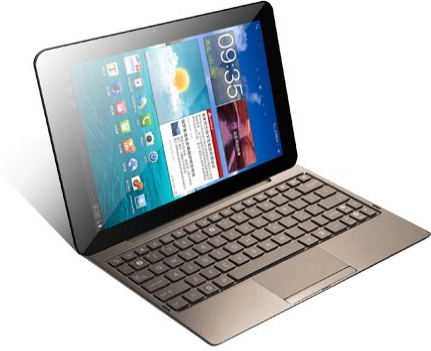 The tablet also features PowerVR SGX544MP2 graphics with support for HD video, 3D graphics, and high pixel displays. That’s a good thing — because the Onda V972 also packs an iPad-like 9.7 inch, 2048 x 1536 pixel display. Onda’s new tablet also packs 2GB of RAM, 16GB of storage, front and rear cameras, and an aluminum case. There’s also a microSD card slot for extra storage. It runs Google Android 4.1 Jelly Bean, but there are already plans for an Android 4.2 software updated. The 9.7 inch tablet weighs about 1.4 pounds. Onda says the tablet should be able to get up to 10 hours of battery life from its 8000mAh battery. 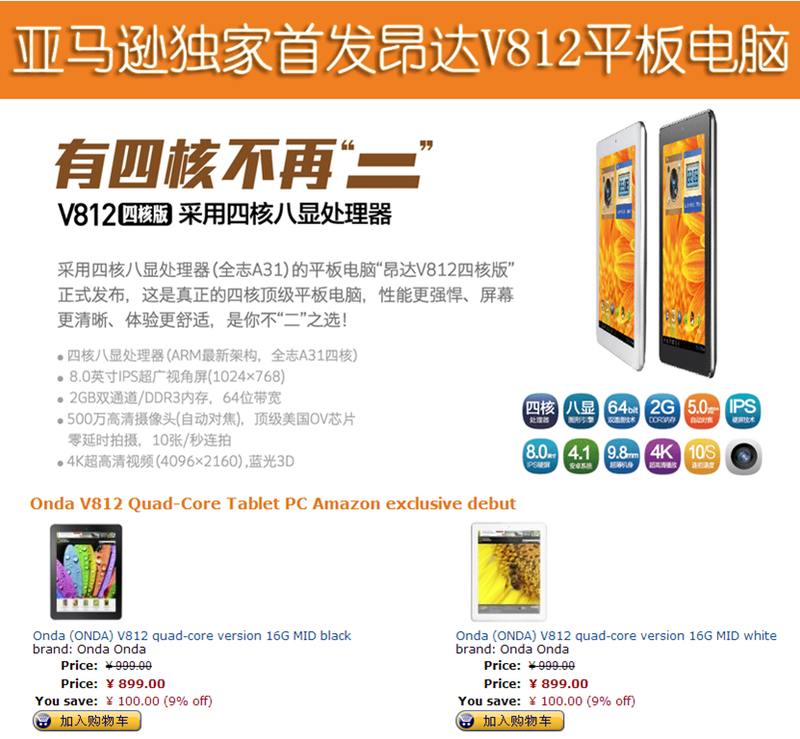 The Onda V972 should be available from the sort of shops that ship Chinese tablets to the US soon. It’s expected to sell for about $240. If you are in store for a tablet with a great screen, up until the recent Nexus 10, you had little choice aside the 9.7-inch Retina iPad. But iPad prices start from $500 and the Nexus 10 starts from $400, which might not be expensive, but is not cheap either. Now, there is another option – a Retina display 9.7-inch tablet for $240. If you thought China, you are spot on. 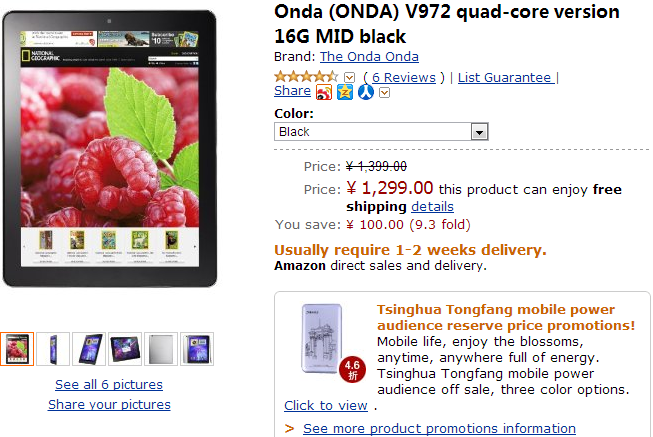 The Onda V972 is the product we are talking about and it is packing quite the muscle for merely $240. First of all, it has the same 9.7″ capacitive IPS display with a resolution of 2048 x 1536 pixels as the iPad. It runs on Android 4.1 Jelly Bean (with plans to get soon updated to 4.2), is almost as thin as the iPad and weighs almost as much at 1.4 pounds (649 grams). The good does not end here. With 2GB of RAM it actually beats the iPad, plus while it has 16GB of internal storage you can expand this with microSD cards. There is both a rear and front facing cameras at 5MP and 2 megapixels. Amazingly, it also packs an 8,000mAh battery that is said to last between 8 and 10 hours. The Onda V927 does not support 3G out of the box, but you can use a separate dongle to get cellular data. Not just that, it has a quad-core processor as well, but here is the catch – it is a less powerful Cortex A7-based one. They just had to take at least one shortcut. Even with that the $240 price tag seems amazing, even too good to be true. And one thing we are sorely missing is high-res images of the device. Then even engadget was alerted from that. where the attached text says “A31 can decode 4Kx2K” which means Digital cinema. Read more about that in section 5. of my large trend tracking post of the ‘Allwinner phenomenon’ on ‘Experiencing the Cloud’ blog which is about “The wireless display and 2160p (“Quad HD”/4K) outlook”. You should then understand quite clearly how much Allwinner moved even ahead of such industry heavyweights as Qualcomm. (Note that Qualcomm’s latest information about its best 2014 capabilities you can understand from my post on ‘Experiencing the Cloud’ titled Qualcomm quad-core Cortex-A7 SoCs with Adreno 305 and 1080p coming for the high-volume global market and China [Dec 9, 2012]). i.e. 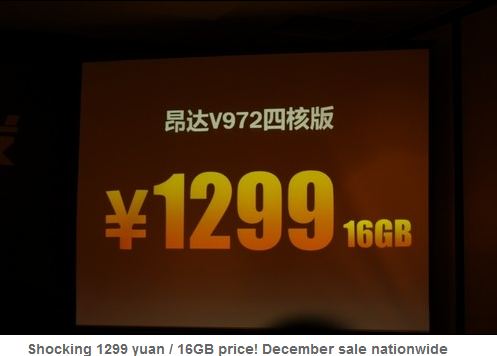 in China the tablet is going to the market for as low $208! The “Onda V972 quad-core version of” the world’s first full-Chi A31 quad-core processor, and is also the world’s first tablet PCs based on ARM’s latest A7 quad-core architecture, with the most state-of-the-art flat-panel processor, performance is fully spike mainstream A9 dual-core tablet, so the tablet PCs faster and more responsive. Onda V972 quad-core version of “the first time in the flat with up to 1M secondary cache, like the processor on the highway, there is no bandwidth limitations, will bring more than 2 times the data processing, transmission speed, significantly enhance the tablet experience. A31 quad-core processor low-power technology, ensuring powerful performance of the tablet, but not any increase in power consumption and heat processor ARM optimum power and performance than the. 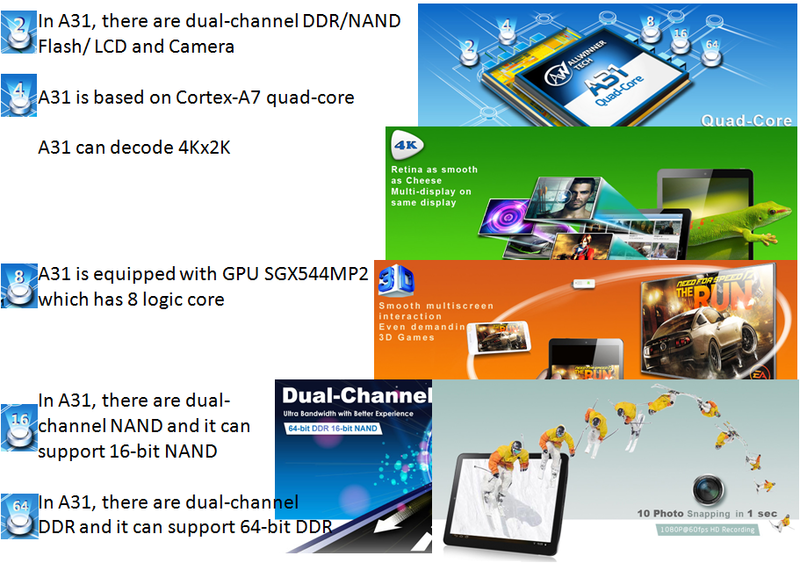 “Onda V972 quad-core version” is the world’s first all interested A31 quad-core processor, is also the world’s first ARM-based tablets new A7 four-core architecture, has the most advanced Tablet processor, performance is a comprehensive second kill mainstream A9 dual-core tablet, tablet computers are faster and more responsive. “Onda V972 quad-core version” also is first in tablets equipped with up to 1M secondary cache, as if the processor on the highway, no bandwidth limits, will bring more than twice times for data processing, transmission speed, impressive experience to Tablet. At the same time, A31 low power quad-core processor technology, ensure the tablet’s powerful performance, without any increase in power consumption and heat, is to ARM the optimal power and performance than the processor. in another rough translation by Bing. 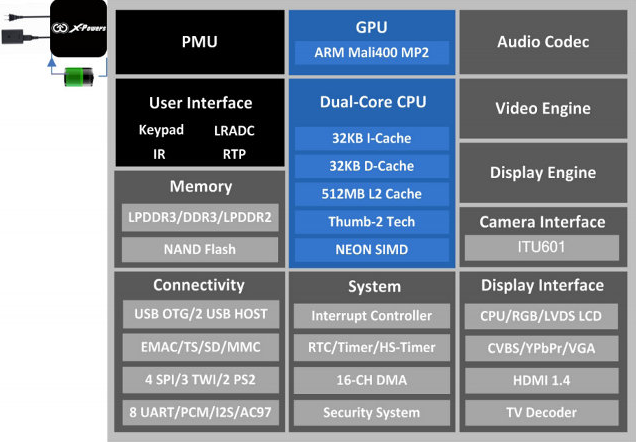 So there is an A20 SoC as well which is dual-core Crortex-A7 only, and also its GPU is Mali-400MP2 which is a dual core of the Mali-400 GPU which was introduced on the A10 a year ago. AllWinner A20 is also pin-compatible with AllWinner A10, so existing products may soon be available for this low cost version. Allwinner Technology is a leading Mobile Application Processor Provider, especially for tablets, Smartphone and Smart TV. 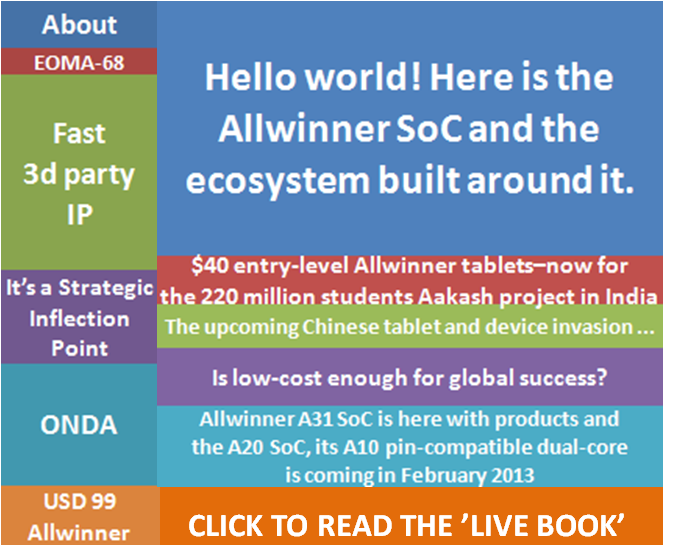 Allwinner has launched quad-core A31 in Dec, 2012 and will launch another A10 pin-compatible dual-core A20 in Feb, 2013. « Is low-cost enough for global success?